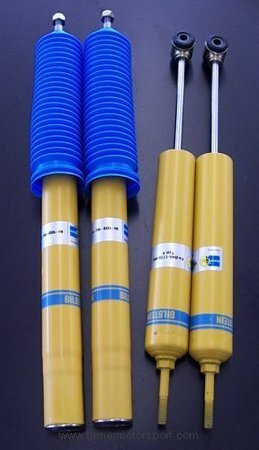 Specially valved and shortened Bilstein shocks matched to go with our "J-Stock" racing springs or any spring in the 400-900lb range. We are continually trying to improve our products and these are the latest evolution of the famed J-Stock shock set. These are not a re-badged set of Bilstein sports. These were originally designed to work with the racing springs used for the BMW CCA Stock Class and are specially built around those specs. The fitment allows more travel than previous versions and the valving optimizes grip when used on a rough track surface (under load). The rear shocks are are also an "inverted" design fitment that eliminates some unsprung weight. Testing showed that these shocks were significantly faster than the previous version - where a TMS JS car set fastest race lap, qualified on the pole, and led the race from start to checker. Requires the larger front strut housings from later E30 models (51mm outside diameter).